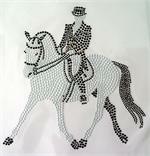 Styled with Black and Clear Rhinestones, Size is about 6" x 5" Can be applied to vests, jackets, sweaters, hoodies, T-shirts and saddle pads. Gorgeous! 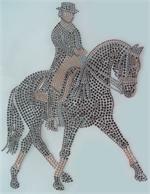 Styled with Black and Clear Rhinestuds, Size is about 6" x 5" Can be applied to vests, jackets, sweaters, hoodies, T-shirts and saddle pads. Awesome! Styled with Copper and Bronze Rhinestuds, Size is about 6" x 5" Can be applied to vests, jackets, sweaters, hoodies, T-shirts and saddle pads. Supper Impressive! Styled with Copper and Bronze Rhinestuds. 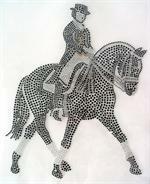 Size is about 6.5" x 5.5" Can be applied to vests, jackets, sweaters, hoodies, T-shirts and saddle pads. Supper impressive.